Salvando um Cachorro e Minha Escuta! When I worked as an Enrichment teacher in a Montessori school, I had direct contact with children and their different learning styles. As you probably heard, we have different emotional intelligence categories affecting the way we absorb information. The common denominator I found for all children to be engaged in learning what I was presenting to them was FUN. If we presented our ideas in a very fun way, they would hold the interest and even the kids with the shortest attention span would be attentive for a long while! I found this book somewhere and decided to try it out in my kids yoga classes; the pictures looked colorful and full of action! I won’t describe what the story is about here, but it lasts for a whole 60 minute kids yoga class! It shows a bear, a moose, gorillas, penguins, an elephant, and more! The protagonist is a little girl in a pink dress, but the boys didn’t seem to bother. On a side note, once I showed up for class wearing a pink t-shirt and this six-year-old boy asked me, “Why are you wearing this color?”. I thought his reaction was pretty interesting! 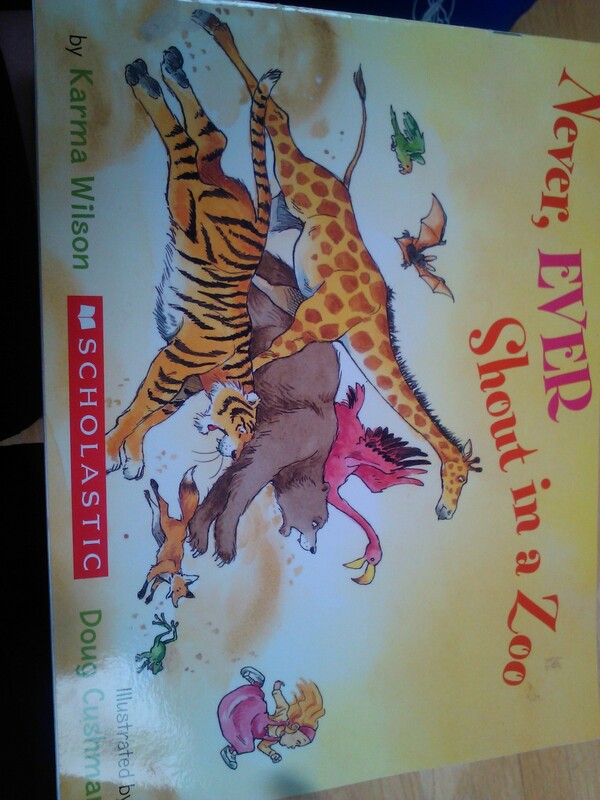 Throughout its 28 pages, we can imitate the animals using our bodies and voices. Great different yoga poses to perform and keep the kids engaged. At the end of the book, I chose to focus on a lesson in how to express feelings without being extreme or having a negative attitude; how can we express our emotions in a positive way? And the final page – with a surprising and suspenseful end – creates just the right atmosphere for this type of lessons, showing what could go wrong if you don’t choose well how to react to adverse circumstances. I highly recommend this book for kids yoga teachers, school teachers, and parents in general. The age range would be from 3 to 8-year-olds. Even if you choose not to act it out with your body, for instance if you are in the middle of the sitting circle in a school setting, the book still makes room for discussion on how to express feelings. And, in my opinion, this is even more important than understanding a whole academic curriculum nowadays. Peace, love and light! Thereza Howling. This entry was posted in Kids Yoga and tagged acknowledge feelings, kids books, kids yoga, teachers. Bookmark the permalink. You’ve made some very good points here about engaging all kids in learning and helping them deal with emotions. I really enjoyed this post. Thanks for sharing it at Booknificent Thursday! Great to have you! Thank you, Tina – for taking the time for Booknificent days, checking all posts and leaving a comment! I’m happy to participate. Sign me up! Seguir este blog!